PNG Women comfortably defeated Netherlands Women by 44 runs in the final round of matches in Group A at the ICC Women’s World T20 Qualifier 2018 on Tuesday, 10 July. The host’s final seven wickets in the second innings accounted for just 34 runs, as PNG bowler as Mairi Tom ripped through their middle-order to deliver a brilliant four-wicket-haul and with it an emphatic PNG victory, which ensured a WT20Q semi-final clash against Ireland on Thursday. Netherlands, however, leave the competition having lost three out of three. It has been a remarkable turnaround for PNG, who were on the brink of elimination on Sunday before throwing the group wide open by defeating the United Arab Emirates. In the first innings of this crucial encounter, PNG posted 129/5 from their innings at the VRA Cricket Ground in Amstelveen, but entering the first ball of the twelfth over at 80/1, they may have expected more from their remaining eight overs, especially with wickets in hand. But that 12th over produced three PNG wickets and they struggled to up the ante after that triple blow. Kopi John had played nicely for 40 from 47 balls before being caught by Sterre Kalis off the bowling off Silver Siegers, before PNG’s Pauke Siaka and Tanya Ruma were both run out for ducks whilst eating up five deliveries. Kaia Arua (20 from 22) partnered Tau for the majority of the remaining overs before the latter departed shortly before the innings terminated. She was bowled by Mariska Kornet as she attempted to make room to go over the off-side but failed to connect. None of the Netherlands bowlers could claim more than one scalp, but Cher van Slobbe proved the most economical, with the right-arm medium bowler only going for twelve runs from three overs. In reply, the Netherlands lost two wickets in the early Powerplay, with both openers, Heather Siegers and Kalis, falling to Ravina Oa, caught by Arua and keeper Tau respectively. Oa bowled beautifully, claiming impressive figures of 2/11 from her four overs. Denise Hannema and Robine Rijke added 36 for the third wicket but thereafter it became the Mairi Tom show, as the right-arm medium bowler cut through the Netherlands' middle order. 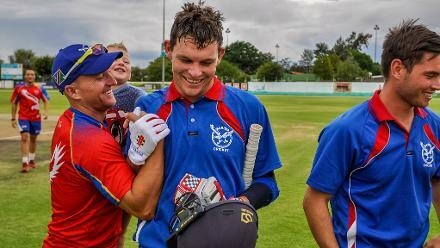 Rijke was the first to depart to Tom, caught and bowled for 17, before the PNG bowler bowled van Slobbe in the final ball of the tenth over, with Netherlands 63/4 and requiring 67 runs from 54 balls. The hosts were going at roughly a run a ball and needed a steady flow of boundaries without conceding too many wickets. Then the real magic happened. Three Netherlands wickets fell on the second, third and fourth ball of the 12th over, and with it went any hopes of a Netherlands victory. There was no Tom hat-trick, however; a Jolien van Vliether run out was sandwiched between Tom’s dismissals of Esther Corder and Hannema, both bowled. The opening bowler finished her brilliant spell with 4/24. Sibona Jimmy and Pauke Siaka both picked up a wicket at the end as the Netherlands were bowled out for 85 from 16.4 overs, giving PNG a well-deserved victory and a semi-final spot to boot.